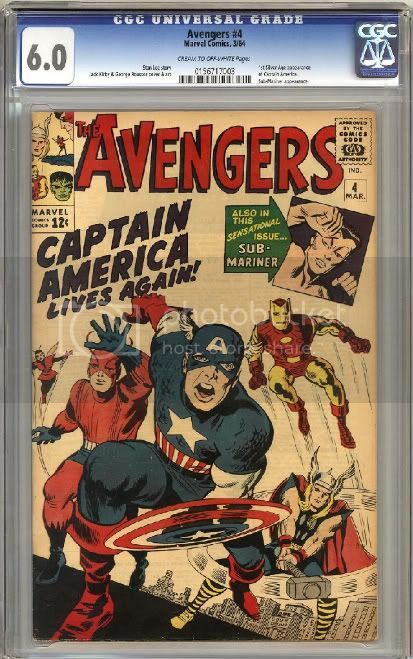 I recently upgraded my VG/FN copy of Avengers 4 to this CGC 6.0 copy. For readers not familiar with comics, this is the first silver age appearance of Captain America... a key book from the early 1960s. I'd prefer a copy with better page quality, but frankly, Cream/Offwhite pages on an early silver age book does not bother me. This book especially seems to commonly display lower page quality with White-paged copies typically commanding a high premium.